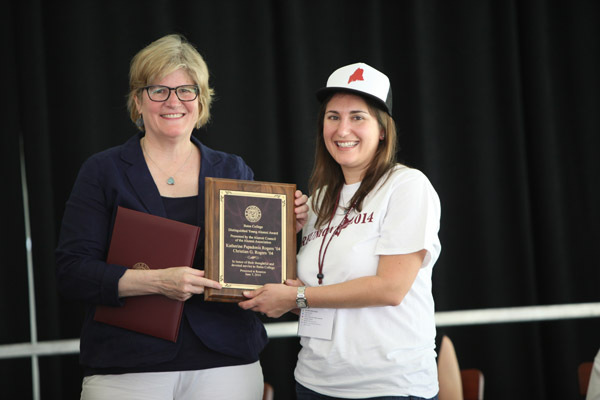 Established in 1987, the Distinguished Young Alumni Award is presented to a graduate of not more than 15 years for exceptional volunteer service to Bates and distinction in his or her career. This year the award was presented to Katherine Papadonis Rogers ’04 and Christian Rogers ’04 at the Annual Gathering of the Alumni Association on June 7, 2014, by President Clayton Spencer and Jennifer Lemkin Bouchard ’99, president of the Alumni Association. The Rogerses were joined by fellow award recipients William “Chick” Leahey Jr. ’52 (Helen A. Papaioanou Award for Distinguished Service), Esther Rosenthal Mechler ’64 (Alumni Community Service Award) and, receiving Bates’ Best awards, Elizabeth Metz McNab ’64 and Victoria Wyeth ’01. Anyone who knows them will tell you that Katie and Christian Rogers are motivated by a deep joy for Bates and a desire to see our college thrive. Indeed, they are fully invested in Bates. Even as students, it was clear that they would go on to do great things for their class and for all members of the Bates community. Katie served with enthusiasm on her Senior Gift Committee and as a BatesStar, while Christian enjoyed working as a tour guide and is a member of the College Key. Today their shared passion for Bates has made them a volunteer force to be reckoned with. Indeed, they are go-to volunteers for all aspects of the college and exemplars for their fellow volunteers, who often look to Katie and Christian for guidance and inspiration. Both have been dedicated to the work of their Reunion committees, where Katie helped the Class of 2004 achieve strong attendance here on campus and Christian, strong participation in this year’s Bates Fund. This dynamic duo is just as connected to current and prospective students as they are to their fellow alumni. Each volunteers with the Alumni in Admission program, and each provides career guidance through the Bates Career Development Center — Katie as a recruiter at Google, and Christian as a vice president at Credit Suisse. But nowhere are their contributions more apparent than in the work of the Bates regional networks. Together Katie and Christian started the Bay Area Bates Network in San Francisco, which is now one of the most active Bates networks in the country. They have also been deeply involved in the New York Bates Business Network. Katie and Christian, your thoughtful approach to philanthropy and volunteerism at Bates is an inspiration to your peers and a boon to the college community. Together and as individuals you embody the Bates values of citizenship, community and integrity. It is a distinct pleasure to recognize and celebrate two young alumni who have done so much for alma mater, and who will no doubt contribute much to a bright future for Bates. For your service, I am happy to present to you the Distinguished Young Alumni Award.